Part 3 of my four-part Navy Battleship rundown with the ever-italicised Mr Hyde113. 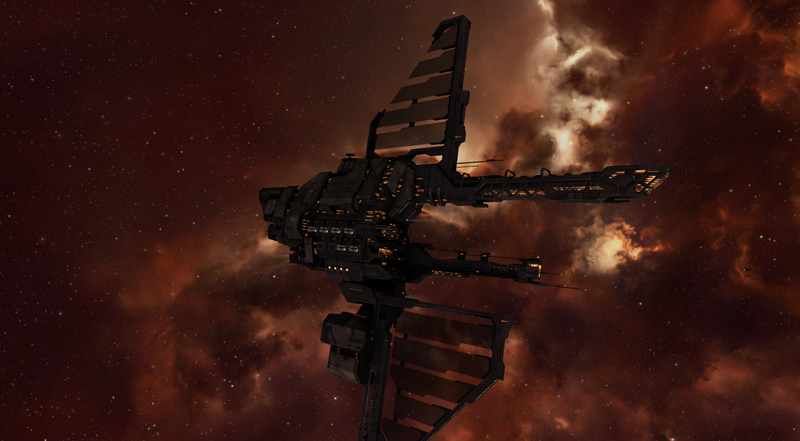 Today, we look at Minmatar faction battleships. On its face, the Typhoon Fleet has the potential to be an insane ship. A 7.5% bonus to Heavy/Cruise/Torpedo missile damage means you get a whole lot of bang for your buck rom each clip of RHML ammo, as well as pretty good alpha on cruise missiles. Then, you have a 7.5% bonus to projectile RoF meaning that it can put out a lot of damage when projectile fit, too. Flat missile damage bonuses generally synergize better with rapid launchers than RoF bonuses because they give more damage per ‘clip’ before hitting the long reload. Higher clip damage is important in solo because it lets you front load more damage before hitting the painful 35 sec reload. The TyFI with 6x RHMLs (navy ammo) and 3x BCU IIs has ~58.4k damage per clip. This is the second best damage per clip of any battleship, with the Barghest taking first place at ~63.7k damage per clip. The regular Typhoon gets a 5% bonus to Rapid Heavy/Cruise/Torpedo missile rate of fire and 5% cruise/torpedo explosion velocity. In terms of slot layout, the vanilla ‘Phoon follows standard Minmatar versatility with a 7/6/7 layout and 6 launchers and turrets, then the Fleet Issue gains an extra high for dat utility. The fitting gain is fairly minimal on this transition, CPU going from 800tf to 825tf and PG (with skills) from 15625MW to 16250MW. Minmatar is usually pretty damn good at offering tank possibilities for both shield and armour in their hulls, but for a Battleship, 5 mids is just not enough in the modern game. The TyFI also gets fairly even base EHP across all HP layers, including decent hull hp, meaning that hull tanking this beast is a pretty effective option. Buffer goes from 33.5k to 49.8k, a little lower than the other BS but in line with Minmatar, shall we say, “build quality”. The increase is fairly evenly spread across armour and shield buffer, though surprisingly the hull mirrors the armour on both vanilla and faction variants. The hull is actually surprisingly good, similar to that of a Megathron Navy Issue. Capacitor goes from 6750 GJ to 7250, giving a recharge rate increase of 1.5 from 20.5 to 22. The regular Typhoon already had a healthy drone capability with a 125m3 and 100 mbit bandwidth; this gets even better with the TyFi going up to 200m3 and 125mbit, allowing a full flight of heavies with a flight of mediums and lights in reserve (or three lights if you prefer). The speed boost is pretty cool; a gain of 10 base m/s makes it pretty fast (for a battleship). Cargo bay drops from 625m3 to 600m3. Generally speaking BS cargo bay sizes are all over the place. This is one of the subtle but important things I hope gets looked at when the next balance pass comes through. Sensor strength goes up by 20% to 27.6 which again, as with Minmatar hulls thematically, remains fairly low, but it’s in line across the board. Overall the TyFI is actually a really nice solo boat whether used with RHMLs, or even more niche cruise application fits. There aren’t many great armor-missile options out there, and the TyFI’s 5 mids and 7 lows mean you have a lot of options in fitting, even if you opt for a nano or hull version. The drone bay is also great, allowing backup smaller flights in addition to a heavy set for brawling bigger boats. I’ve had a lot of success in the past with a brick tanked slaved TyFi defensively fighting larger groups, with the dual heavy neuts really helping stop kiters. The Barghest does the solo missile role better in most respects and comes with the point/scram range to boot, but it’s considerably more expensive and has a bigger fear factor leading to more overblobbing. For autocannons, the better choice is the Fleet Tempest which we’ll speak about later. Personally, I’m not a fan of dual-weapon system hulled ships. Ideally it means you can fit one or the other, bringing more variety and unpredictability, but nine times out of ten, one weapon system will be clearly superior, as is this case with missiles here, and the other hull bonus is wasted. The bonuses are individually stronger than normal to make up for the forced choice, but it’s still only like having 1.5 hull bonuses on your ship rather than two, which weakens it considerably when compared to other hulls designed to serve specific roles. The pirate ship to compare the RHML Typhoon Fleet Issue to is the Barghest, at 390m and 750m respectively. The Barghest is clearly superior in most situations, but unlike some battleships (I’m looking at you NScorp and Rattlesnake, see you next article), this is well-reflected in the pricing. One of the few Navy battleships along with the NApoc to see use in larger nullsec fights, the TFI has been used by both the CFC and PL to great effect, by the former as an extension of alpha fleet, and as a hard-tanking battleball fleet named “Gravellers” during PL’s Catch campaigns. The TFI has a great slot layout for this job; enough lows for a beastly armour tank, enough mids for utility and the golden double utility high in a combined 8/5/7 slot layout, gaining a low slot over the vanilla ‘Pest. The Tempest Fleet doesn’t really come up to scratch for me as a good solo boat, especially when you consider what little you get in the way of power over the vanilla Tempest. Granted, at the time of writing this article the Tempest Fleet is only 292 mil, which makes it only 100mil more than the vanilla, and by far the cheapest Navy battleship out there. However, prices tend to fluctuate with changes in the FW warzone and don’t always indicate whether a ship is popular or worth it. The Tempest Fleet really seems to be more of a fleet-oriented ship, which is fine because not every BS needs to be some unique solo-pwnmobile. Overall there isn’t really much to say about the TFI; it’s pretty average and unimpressive so I generally skip it in favor of more interesting boats. In terms of hull bonuses, things get a little weird. Until recently, the Tempest and TFI got the same bonuses: 5% per level to Large Projectile rate of fire and damage. In the Aegis expansion, the regular Tempest’s RoF bonus went up to 7.5%, but the TFI remained untouched. With an equal amount of turrets, this means the regular Tempest actually does more damage than its Navy brother with equivalent fittings. Buffer is a little better than the TyFI, going from 37.4k up to 55k, manifesting in a little more armour, equal hull and a sliver more shield EHP. Capacitor only goes up a touch, 125 GJ from 6750 to 6875. Nice, but not enough to be that meaningful. Speed is a little lower than the TyFI. The Navy ‘Pest is as fast as the regular ‘Phoon, which isn’t that slow but it’s not going to win any races. The align time actually increases by 0.3s. Unlike the Typhoon, the cargobay increases in the Fleet version by 50 from 600m3 to 650m3. Sensor strength ups from 24 to 28.8 and lock range increases by ~10% to 92.5km. The Tempest Fleet Issue is a damn steal right now at 290m for the hull, but unfortunately (and this is, perhaps, why it’s cheap) the TFI is actually overshadowed by the vanilla Tempest as one extra low slot is not worth that DPS difference. The natural pirate competitor to the TFI is the Machariel, which tanks ever so slightly less, but has that crazy warp speed, is super fast, and gets a useful falloff bonus. The Mach gets an extra turret with the same damage bonuses, so you can fly it like a TFI and drop a gun or go for more damage and do the full seven with one utility high still left over. The Mach is sitting at 400m right now, so overall the only reason you’d choose the TFI over either is because your primary concern is needing a crazy armour tank on an artillery boat.